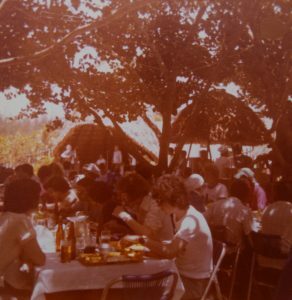 A collection of photos from the 1978 World Festival of Youth and Students. Credit: Padraig Mannion. We thought we knew it all back then though we probably didn’t know much of the world beyond building sites in London. Some people might have gone on J1 visas to the States. For one or two people who were doing languages it was part of your course to spend a summer in that country. But by and large the idea of travel as we know it now just didn’t exist. Because of the ferment of the times, though, we would have been very engaged with international affairs – the Vietnam War, Chile, and obviously the anti-apartheid struggle, as well as the changes that had happened in Portugal and the freedom movements in Mozambique and Angola. To Irish people at the time Cuba was very much a beacon. The idea was that if Cuba, which was 90 miles from Florida and in the complete and total shadow of the United States, can not only have a socialist revolution but build communism, then it gave inspiration to every revolutionary group and socialist and communist in every small country in the world. There had been a number of World Festivals of Youth and Students at that stage and there had been Irish participation in a number of them, particularly at the previous festival in Berlin. When it was announced that the next Festival was in Havana, there would have been a call from the International Union of Students (IUS) and the World Federation of Democratic Youth (WFDY) to their affiliate organisations, USI and the Connolly Youth Movement respectively, to convene a national preparatory committee and to have the participation as broad as possible on both the committee and the delegation. Sharing an Irish delegation t-shirt. Democratic Youth Movement, the National Youth Council, the youth group of Conradh na Gaeilge, and various church groups. 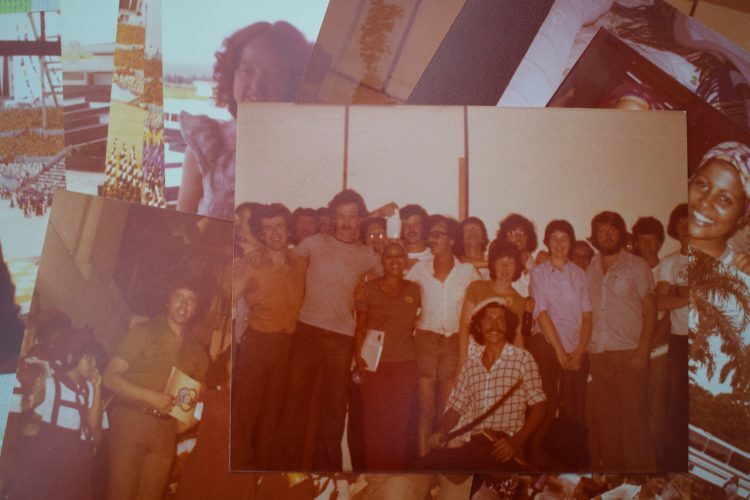 That summer I was the outgoing vice-president of UCG students union and the incoming international affairs vice-president of the Unions of Students in Ireland (USI) so I went with the USI delegation, though I was also a member of Official Sinn Féin. We would probably have all had different intentions for the trip but a large part of it certainly was just the adventure of going to Cuba. Very few people from Ireland in the previous twenty years had been to Cuba so there was a sense of adventure to it. The other thing was going to see a country building socialism. I think we were hugely interested to learn and also to meet people. There was a great sense of openness and an expectation and hope that we would be meeting with people from all over the world – people from Vietnam, Africa, the ex-colonies, people still fighting for their freedom. To my knowledge there had never been a flight to Cuba. The technical arrangements were very, very difficult. There was an idea that perhaps we’d fly to London and go from there along with the British delegation or fly to Paris or Spain. Then through the International Student Travel Association USI managed to make a deal with the Polish Lot Airline: the Warsaw to Montreal flight would stop over in Ireland, fly to Montreal, go down to Havana and drop us off, return to its normal duties, and then collect us all ten days later. 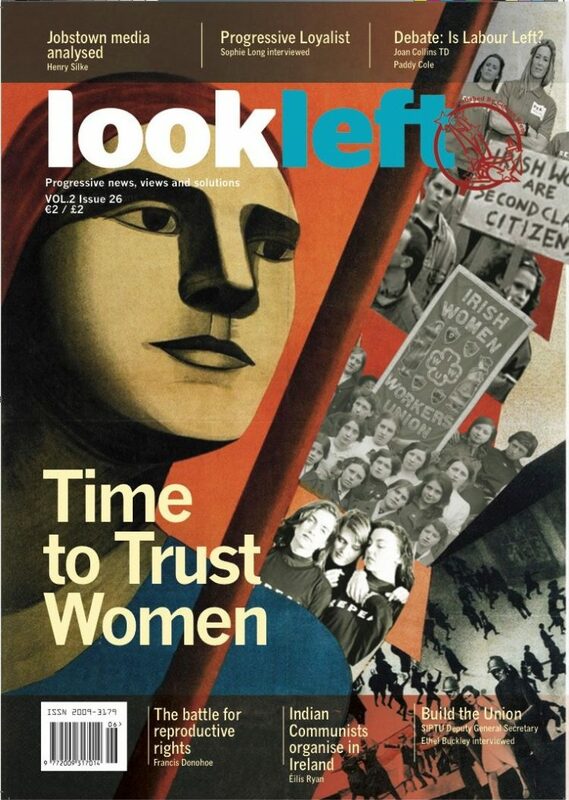 This caused huge problems for different sections of the Irish government. It certainly seemed to be that different sections of the government were fighting amongst each other about whether this should or shouldn’t be allowed. And I think it depended on who jumped up and down the most. But eventually the flight was permitted. It saved us two or three days travelling, made it cheaper because of Lot being the State airline of a socialist state, and just made things easier. There was just a lot of hassle of Irish people flying through British airports at that time. You could be detained for an hour, five hours, or five days on a whim. You could spend the World Festival of Youth and Students in a police cell drinking cold tea and eating toast and having policemen laughing at you, which wouldn’t really have been a whole pile of fun. Although the flight did eventually go, it didn’t leave until the morning after it was meant to due to a delay in Warsaw. So we got some sleep at some stage, probably a few drinks, and there was a massive big sing-song as I recall. One or two people had Uileann Pipes so they were brought out, as well as guitars, whistles, and whatever else. What the delay meant was that we were there in the morning to read the papers. One of the groups that had originally been proposing to go on the trip had launched an attack on us on the basis that we were safely gone but of course we weren’t. We were there and we were able to get on to the media. We were able to jump on that from a great height. When we walked off the tarmac in Cuba the place was shimmering with heat. I know it was July in Ireland but you still had your average slightly damp or threat-of-damp July weather and then you walk off the airplane and there was just a level of brightness for people who had never been in a country with that level of sun or that level of heat previously. It was a busy ten days. Certain things everybody in the delegation was expected to take part in and then there were certain times when events were organised and you could turn up or stay in bed or wander around Havana as you liked. There were quite a lot of meetings with other groups, cultural events, trips to areas of historic interest. There was an event where you visited different houses and another to the Bay of Pigs. I remember I spent hours and hours on a bus. And then sometimes there was free time you could go down to the local village or go to different areas, depending on what buses were available. We stayed in a school outside Havana. It was quite a big complex, with the Danes and the British staying in other sections. Some delegations were really high in demand, like the Vietnamese because of victory having been achieved and the Palestinians (the PLO). Although we would have met the National Union of Students (NUS UK) on a regular basis, unless somebody went to an IUS meeting you wouldn’t have met the French students or the Spanish or the Scandinavians. So certainly there was a hope that if it was possible we’d meet as many as we could but you still had to fit into the overall delegation. There was a producer who worked in RTÉ by the name of Chloe Gibson. She was brought over essentially as the person to deal with the cultural event presented by the Irish, which was a sort of history pageant. There wasn’t an agreed version of Irish history within the delegation and there wasn’t an agreed version even of current affairs so I think it was her interpretation of Irish history that was the agreed interpretation. 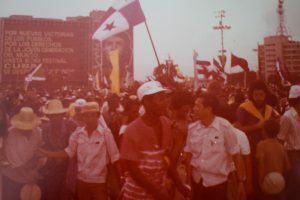 Despite the propaganda that all the migration had been from Cuba to the US, a number of the interpreters and people we met had actually lived in the States prior to the Revolution and had come back to Cuba because the threat of imprisonment was gone and they felt the chance to build a new society was there for them at that stage. One of our interpreters had actually spent quite a lot of his time in Texas and had come back after the Revolution. A lot of the time it was difficult to interact with locals because I don’t know if anybody on our delegation spoke Spanish. We had our phrasebook and some of the older people we met would have had English because they would have dealt with the Americans who would have run the plantations, the hotels, and the casinos before the Revolutions. Obviously we knew that there was going to be an effort made for the World Festival, but I think you can know a lot by the attitude of people – I think if people have a certain level of resentment (“more foreigners, more Russians, more whatever”) that you get a clear sense of that. 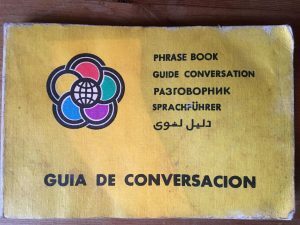 The conversation guide included phrases such as “peaceful coexistence”, “national liberation movement”, and “right to self-determination”. huge event that everybody went to. It was just massive, with all of the young people from all the different parties, all of the planning committees, all of the people who had been in the backroom, all of the interpreters. There were food stalls and stalls where you could get a bottle of beer or rum and coke or whatever. 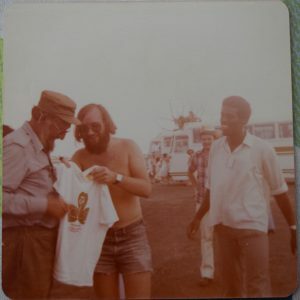 Fidel wandered around in his jeep – he was here and there and certain people did get to meet him and shake hands with him and other members of the leadership. It’s hard to know the effect the trip had on people. It was a rude lesson in the difficulties you’d face having a socialist revolution when you see the machinery doesn’t work because there’s a particular type of screw or rivet that you can’t get your hands on due to the embargo. But I also think it reaffirmed that if you had a popular socialist uprising and people were committed to building socialism that there was a way around those difficulties. It also became clear to us that, despite the Soviet Union’s economic subsidy and military reassurance, Cuba wasn’t a satellite state but had an indigenous socialism arriving from their own ideology and adapted to their own situation. There certainly was some level of cooperation afterwards in the Ireland Cuba Friendship Society and the Ireland Cuba Solidarity Group. In one form or another the group has continued to this day. It was particularly active in the campaign for the Cuban Five and is still active in the campaign to end US sanctions against Cuba. The trip probably didn’t have the complete desired effect but certainly I think it had a beneficial impact on developments.